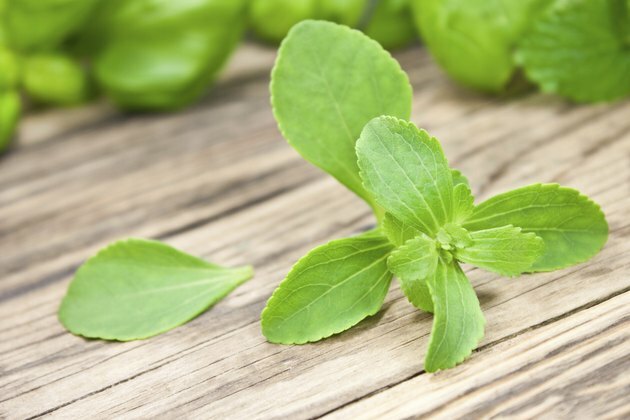 Stevia, a natural sweetener native to South America, is a plant much sweeter than sugar and considered to be beneficial for many health conditions, including obesity and hypertension. Stevia was approved for sale as a sweetener in the United States in 2008. However, stevia may cause allergic reactions in some people. Oral allergy syndrome is a condition where the body mistakes proteins in fresh fruits and vegetables as pollen, which causes the immune system to react. If you are allergic to ragweed, there is a possibility you may have an oral allergic reaction to stevia. Other foods that may cause a reaction include bananas, watermelon and other melons, zucchinis, tomatoes and sunflower seeds. Symptoms can include swelling and itching of the lips, mouth, tongue and throat, hives, abdominal pain, nausea, vomiting and a tingling sensation in the mouth and throat. If you do not know if you have an allergy to ragweed and are worried about a reaction to stevia, determine if you suffer from hay fever. Hay fever is caused by ragweed, and is at its peak from August to October from the east coast to the midwest of the United States. Symptoms include itchy, watery eyes, sneezing and a runny nose. If you have these reactions to ragweed, exercise caution when using stevia until you know how your body reacts. The best way to prevent an allergic reaction to stevia is to avoid using stevia. Many substitute sweeteners are available on the market. If you prefer a natural sweetener, reconsider your use of sugar, or look into using honey or agave nectar. Immunotherapy, or allergy shots, may also be an option for preventing severe allergic reactions to stevia. Talk to your doctor or an allergy specialist about immunotherapy for stevia allergies. There are limited treatments for oral allergies to stevia. If you have a mild allergic reaction, such as hives, a runny nose, or mild tingling or swelling in your lips, an over-the-counter antihistamine can help relieve your symptoms. If you have a more severe reaction, such as severe facial swelling or anaphylaxis – symptoms include difficulty breathing, severe drop in blood pressure, or dizziness or loss of consciousness – treatment includes an emergency injection of epinephrine and emergency medical care. If you suffer allergic reactions to stevia, talk to your doctor or allergy specialist about emergency epinephrine injectors.